Jean-Luc Geha, BBA, EMBA, P.CRM., is a Guest Professor of Marketing at HEC Montréal, academic supervisor of the marketing option in the BBA program and coordinator of the Intensive Marketing Program at Executive Education, HEC Montréal. As such, his responsibilities include inter-university equivalencies, development of the BBA marketing program based on the specialization structure and market needs, as well as the creation of new courses and seminars. Professor Geha is Associate Member, Chair in Service Marketing and Customer Experience and recently created various seminars on customer service and business processes which he taught for the Executive Education, HEC Montréal abroad. He collaborated in the first English edition of the book entitled Marketing Management. He teaches courses on marketing, distribution (B2B), relational sales, management of large corporations and consultation in the BBA, MBA, Specialized Graduate Diploma and certificate programs. 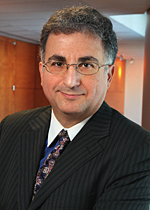 Professor Geha has lots of corporate experience in positions of consultation, sales management and general management. As a manager, coach and mentor, he is known for his expertise in sales, contact centre management, customer service and customer experience. He can explain complex concepts in easy-to-understand terms and has a talent for bridging the gap between theory and practice.